After you have spent some time learning your chords, scales, basic music theory, how to read sheet music, and tablature you realize you want to start adding some flourishes and new techniques to your Uke repertoire. There are multiple ways to improve your sound and make your audience think you are a master at the ukulele! A hammer-on is a method of moving up from one note to another without re-plucking a string. Basically you play the string one time, yet by hammering on you can play multiple notes. Place your index finger on the second fret of the E string, pluck the string and immediately press down on the 4th fret of the E string. Here you played two notes with only one pluck of the string. If you play fast enough you can also hit the 5th fret of the E string, thus striking three notes on one pluck! The movement for the hammer-on is all in your fingers, there is little or no wrist movement. The pull-off is the exact opposite of the hammer-on. Place your fingers on the 3rd and 5th fret of the A string. Pluck the string and let one finger up from the 5th fret, that way you are now playing the 3rd fret. Just like above you are playing multiple notes with one pluck, but this time you are remove your finger to let the open note (0) ring. Just like hammer-ons if you play fast enough you can do this with multiple notes. The ukulele doesn’t have much sustain so we are unfortunately limited to a few notes for each hammer-on or pull-off. Now instead of striking the notes after plucking the string we will slide up them. Be sure to press firmly on the string when sliding. Pluck the E string with your ring finger on the second fret and slide up to the 4th fret. This means you will pass and play the 3rd fret as you slide up the ukulele. If you slide properly you will hear all three notes from the 2nd to 4th fret. Practice making your slides longer, from the 2nd fret all the way up the neck and back. A great slide effect is to go back and forth between a few notes. (If you have trouble sliding up the fretboard of the ukulele there may be an issue with your frets or perhaps the board needs to be cleaned). You bend a note by pushing the string up or down (depending on the position of the string, clearly the A string cannot be bent downward or it will go off the fretboard). It literally “bends” the sound of the note making it sound higher pitched. Bending nylon strings are a little different and more difficult than steel guitar strings, but the effect can still be achieved. If the notation shows a half bend we only bend the note a little (a half step), a full bend attempts to bend the note a whole step. On the Uke full bends are not always that easy, but we do the best we can. Bends happen to work the best on the two middle strings. The trill is rapid pressing and releasing of a string, basically hammer-ons and pull-offs played very quickly. Go back to the 2nd fret of the E string, pluck it and quickly press and release the 4th fret in fast succession. As mentioned the ukulele does not have much sustain so our trills our limited, however they still can be useful. If the string is plucked loudly and the pressing and releasing is done firmly and very quickly the trill will sound great! 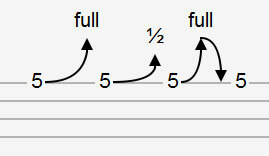 Trills are notated in tablature and regular sheet music with a tr or squiggly line. Notation of a natural harmonic. This is a more difficult technique, especially on the ukulele, and works best on larger size Ukes, but when done right it will sound like chimes. Place your index finger lightly over the A string at the 12th fret. Literally the finger should barely be touching the string, and as you pluck the string immediately release the finger at the 12th fret. If you position it just right, pluck, and release the string it will sound like a chime. You can do this with the other strings at the 12th fret also for more chime sounds. It takes time to get the slight pressure and quick release just right, but once you have it down it is a cool effect. If you want to add a Spanish guitar type sound into your ukulele playing you can work on tremolo. Playing tremolo on the ukulele is basically just strumming the strings back and forth very rapidly with the index finger. It sounds easy to do but takes lots of practice to put just the right pressure on the strings with your index finger along with the correct and quick movement of your wrist. It can be easier to start with tremolo on a couple strings and practice until you can manage all 4. Once you are good at striking all 4 strings rapidly the tremolo will sound very nice. If you really want a challenge, try doing the tremolo effect by using more than one finger on your left hand. It can be seen here and requires even more practice! There are multiple ways of getting a percussive effect on your ukulele, sometimes using your thumb, but I find the best way is to use the index finger. As you strum the chords with your index finger let the top of the finger strike just below the bottom of the Uke sound hole. At first this may cause a little discomfort but with practice you will find the sweet spot on your index finger that won’t hurt when you strike the wood of the ukulele. This is a great technique to combine with fingerpicking. As your thumb picks the top strings your index finger can strum the bottom strings and strike the wood at the same time giving a nice percussive sound. As long as it is not overdone (perhaps only on the 2nd and 4th beat of the measure) it is a fun effect for some songs. You can experiment with other percussive techniques while playing. The Uke seems like a simple instrument, but with some fancy techniques you can really spice up your playing! what is the E string? That’s the second one (from the bottom) in standard tuning.